My first waking thoughts filled with dread. Today is the day. After the sweatpants, the food, and the relaxation of Christmas break, today was the day my daughter was back to childcare, and I was back to work. 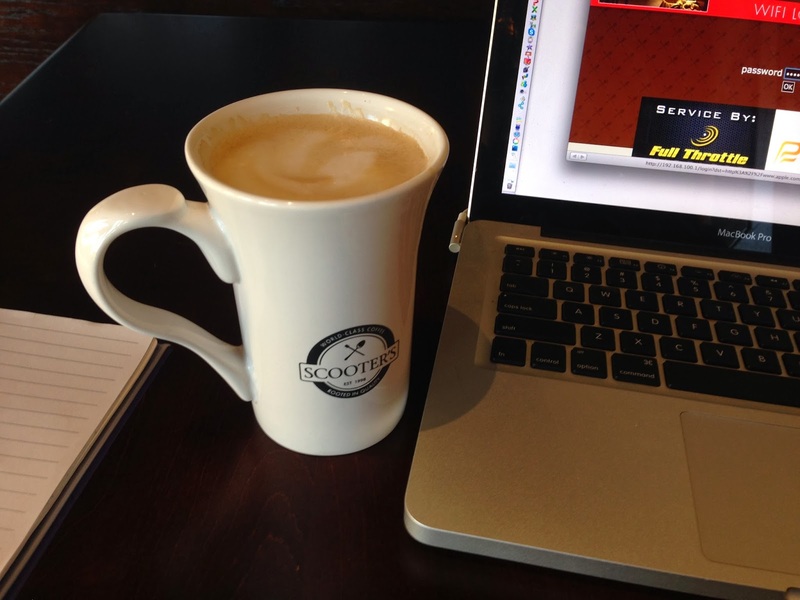 I had a day’s worth of computer tasks, so I planned to lessen the un-fun-ness by doing the work at Scooters. With a yummy coffee at my side, my plan was to dive into my computer screen and only emerge when I had forced my to-do list into submission. Growing up, I saw my farm family valuing hard work, so “nose to the grindstone” has always come somewhat naturally to me. I’m thankful for that gift from my upbringing, but this morning as my coffee sent up wisps of steam, and I plugged in my computer, I couldn’t shake the sense that this anxious me, this shoulders-tight, this get-it-done-now-and-fast-and-perfect me, wasn’t really AT the coffee shop at all. She was somewhere else with a self-imposed veneer separating her from the rest of the world. I might as well have been working in the middle of a highway. I sensed God pulling me into a different work day. I took a deep breath and prayed that God would help me 1) embrace what could get done today, 2) somehow enjoy being at the coffee shop, and 3) leave the rest for tomorrow. As I prayed, a thought jumped into my head: I should call my friend and see if she wants to stop in for lunch. Just as fast, another thought battled back–NO, no, no, you don’t have time! My original lunch plan was to gobble something with fingers typing between bites, eyes still handcuffed to the screen. Remembering my prayer, I texted my friend before I could talk myself out of it. I didn’t have time to close my screen for our lovely lunch. But, as I closed my screen again at the end of the day and zipped it into my black backpack, the work was somehow done, and done in a way that had the fragrance of God–beyond my understanding. Our Psalm today talks about the helpless, the afflicted. Certainly this refers to others, but quite often I stick this label on myself, seeing the day with a lens that God didn’t intend. God gives me abundance; I see scarcity. We can be thankful for our God who encourages us and helps us to see a new way, a better way, calling us home even in the midst of a day like today.